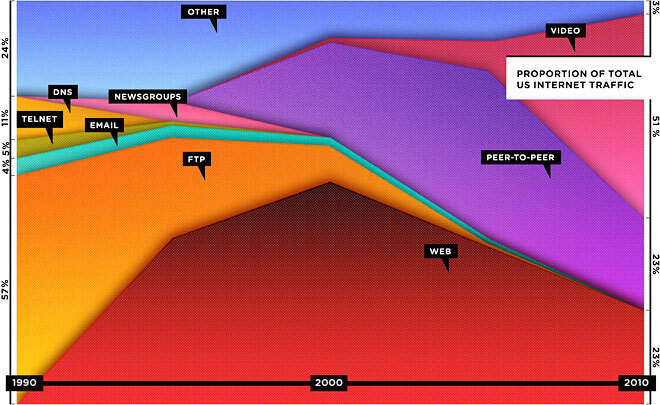 A fascinating article in Wired, on the shift from the “open web” to an app-driv en world. In one world, Google dominates, and we play the SEO game if we want to be seen and play a big role in it; in the other, Apple and other mobile platform providers set the rules of engagement. It’s the difference between wandering from site to site and using Facebook as the center of your online universe; between the open flexibility of HTML that anyone can set up an online storefront in and the closed-off world of specific function that apps offer. Today the content you see in your browser — largely HTML data delivered via the http protocol on port 80 — accounts for less than a quarter of the traffic on the Internet … and it’s shrinking. The applications that account for more of the Internet’s traffic include peer-to-peer file transfers, email, company VPNs, the machine-to-machine communications of APIs, Skype calls, World of Warcraft and other online games, Xbox Live, iTunes, voice-over-IP phones, iChat, and Netflix movie streaming. Many of the newer Net applications are closed, often proprietary, networks. It isn’t the end of the World Wide Web, by a long shot; both the open system and the walled gardens will likely co-exist. But the shift to mobile platforms, where apps dominate, and the business imperatives of trying to build commercial advantage in a new environment speak to a lot of money and energy being poured into the world of apps, and certainly by media companies. So it’s hardly a surprise that publishers – and not a few journalists – are rushing to embrace the new world as a magic bullet that will save Journalism-As-We-Know-It. Or at least Media-Companies-As-We-Know-Them. For some, the idea is that we’ll get to reboot: To get past our “original sin” of not charging for content. For others, it’s that the app world encourages professional content, the way cinemas encourage feature films rather than YouTube videos. That should benefit larger media organizations, which have the capability to turn out high-end content. Now, I’m all for charging for content if we can; I do think too many publishers drank the Kool Aid of free content back in the day. But I’m not optimistic that subscription revenues, while welcome, will turn into a significant stream of income that supports newsrooms – at least as we know them. And from my limited experience with creating content for the iPad, I’ll definitely agree that it’s not a simple process to turn out high-quality content for that platform; it’s much easier to throw up a website quickly. And certainly the approval process at Apple will make anyone but professional app builders pause. But that doesn’t mean people will flock to content on apps simply because they’re harder to make – there are lots of professionally-made movies that bomb. Indeed, there are many that are shown in cinemas that don’t deserve to exist at all. So I’m skeptical that the world of apps is any better for journalists that the wild west of the web. It will be different; that’s clear. And with the new platforms will come new behaviors and ways of accessing information, and we’ll have to keep up with them. If anything, it’ll be more costly to try to understand that world as well as the web world – and whatever else comes along. The great danger is that we’ll keep doing what we’ve been doing: Throwing everything at the wall and seeing what sticks, without really understanding how people want information and how each platform is different. We have to be where the audience is, that’s true. But successful movie studios don’t insist that every movie they create also have a book, TV, iPad, iPhone, Blackberry, YouTube, online and home game component. We might want to learn to specialize, too. It is important not only to understand how people want information, but to further shape their way. Many people won’t realize the impact of new platforms until they get the experience. So do journalists – if they continue to just use pen and pad (which is not bad), and never use iphone or ipad, it will be hard for them to understand how readers would consume their stories – let alone to produce a story that fits readers’ needs. That is why I think Southern Metropolitan was smart in the investment of buying their journalists iphones just to help them adapt to the new technology. Yes, it’s a good idea, and a step forward to buy the phone. I know certain people who have a new shiny phones and are still not using Twitter, o sacrilege. Maybe it’s not down their alley. I think however that a lot a matter of education — educating about the dynamics of the flow of information and understand where they/we fit in as contents-producers. And speaking of experiencing, I didn’t have a smartphone until a few months into living in HK. And moreover, cheap mobile broadband made my experience even more compelling. Electricity was the killer app of the early 20th century; so will ubiquitous and cheap broadband internet be for this coming decade. It’s true – it’s hard to really understand how a new medium works until you experience it. Some senior execs in news orgs are barely on email; that explains quite a lot. Journalists need to be on a wide range of platforms and devices just to know what can be done and how things are done – obviously with limits, so they don’t just spend all day on Facebook. Like chefs who need to eat out a lot so they get a sense of where the industry is going, journalists have to be voracious consumers of media; at the same time, they need to not make the mistake of assuming everyone else consumes media at the same rate, too. It’s a fine line to walk.